It’s a common winter woe. Let’s look at the options for overcoming this icy problem. 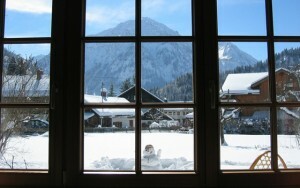 Are you really feeling cozy and warm while gazing out the window into a frozen landscape? I didn’t think so. ‘Tis the season to sing this classic tribute to hearth and home. But are you really feeling cozy and warm while gazing out the window into a frozen landscape? I didn’t think so. Some degree of cold is inevitable around a “winter” window, because heat always moves from warm to cold. The warmth from your body will naturally radiate toward the colder surface of the window glass. But there are other factors involved too, and that’s what this blog is about. You can’t stop your body from radiating heat. 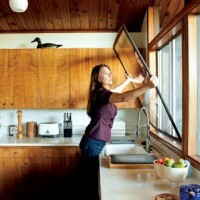 But you can do a number of other things to cut down on drafts and heat loss associated with windows. Correction requires detection. An infra red camera provides a thermal portrait that can identify air leaks and missing insulation –two problems associated with drafty windows. 1. Scope out the cold spots with infra red imagery. Although this isn’t a “fix,” I have to mention it because infra red imagery is by far the best tool for uncovering air leaks and missing insulation –two conditions associated with drafty windows. An infra red camera uses color variations to show temperature differences in surfaces. During the winter, cool colors (like green and blue) in an interior image identify problem areas. 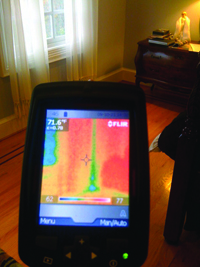 Home energy analysts (like Dr. Energy Saver contractors, for example) frequently use infra red cameras to detect problems and guide corrective actions. 2. Make sure the shim space is sealed & insulated. The framed opening for a window or door is typically about ¾ in. larger than the window or door unit that is installed in the opening. The gap between the window or door frame and the house framing is called the “shim space.” If the gap isn’t filled and sealed with spray foam insulation, it’s going to provide a major pathway for cold air to get into the house. An infra red image will reveal an open shim space, but sometimes detection is a lot simpler: You can feel a cold draft around the edges of the window casing. If you suspect this problem, consider carefully prying the side casing off a particularly drafty window. If you don’t find the shim space filled & sealed with spray foam, all your windows may have this deficiency, and it’s definitely worth correcting. A skilled carpenter should be able to pry off your trim and replace it once shim spaces have been foamed. Try a 2-foam treatment. A common technique for sealing & insulating the rim joist combines rigid foam inserts with spray foam that fills & seals gaps. 3. Seal & insulate the rim joist. OK, I know the rim joist is in the basement or crawl space –so how can it cause drafty windows? Building science research has shown that there’s quite a bit of communication (leakage) between the basement (or crawl space) and the main living space. There are holes drilled to run wiring into upstairs walls, normal construction gaps & cracks, plus large openings cut for forced air ductwork. These pathways allow cold basement air to move upstairs. The cold air chills wall surfaces and enters your living space through openings around electrical outlets and baseboard trim. The lesson here is important: It’s easy to blame your windows for chilly drafts that are caused by other air leaks. 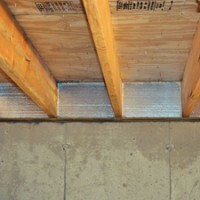 By sealing and insulating your rim joist, you can eliminate a major source of cold drafts. This is a very common repair for home performance contractors to make. Stay warmer with interior storms. Custom-made storm inserts will cut heat loss without the high expense of replacement windows. 4. For immediate relief, use insulating curtains & interior storm windows. Used separately or together, these affordable, low-tech solutions will make window “zones” more comfortable. I tend to favor interior storms over insulating curtains because they don’t block the sunlight or the view outside. If you live in an older house with single-pane, double-hung windows that rattle around in their jambs, interior storm windows will definitely reduce drafts and your heating bill. For a low-cost interior storm treatment, look for window film kits that consist of clear plastic film and double-stick tape. For reusable interior storms that are more attractive, step up to custom-made inserts from suppliers like Indow. U.S. Dept. of Energy tests showed that Indow inserts can reduce energy use by more than 20%. I know what you’re thinking: It’s about time we got to this option. But I’m putting replacement windows low on the list for two good reasons. First, they’re much more expensive than the draft-stopping strategies mentioned above. Secondly, replacement windows will NOT stop cold drafts that are caused by open shim spaces or a rim joist that hasn’t been sealed and insulated. For comfort and cost effectiveness, it’s better to make basic building envelope improvements (Fixes 2 & 3 above) before you pay thousands of dollars for replacement windows.